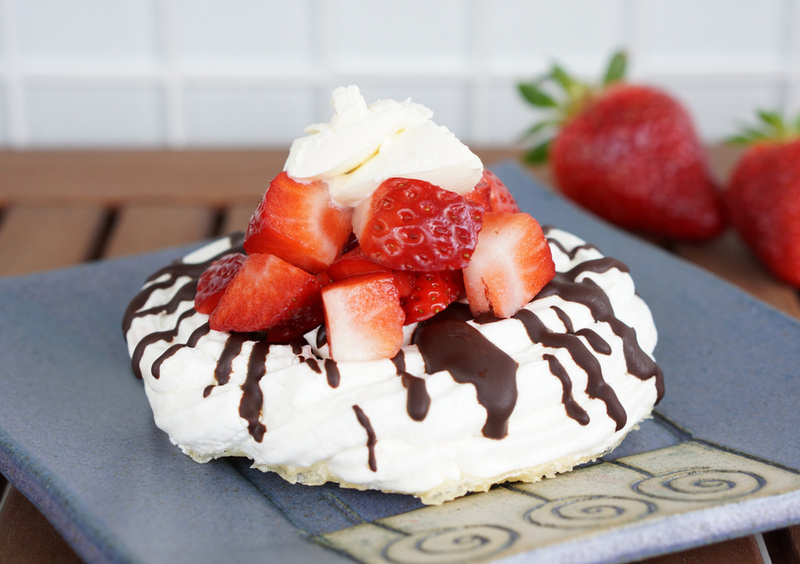 The most crucial aspect of making meringue is to have everything free of fat or grease. Everything. The bowl, the mixer and also the egg whites. Make sure that there is no egg yolk anywhere close to the egg white. While separating, it is OK to have some egg white left with the egg yolk, but not the other way around. The second crucial aspect is to beat that egg white for a long time. You beat it without anything further until is forms soft peaks and then gradually add the sugar. The meringue should become glossy and stiff. Really stiff. You should be able to turn around the bowl with nothing falling out. You should be able to write numbers with the mixer into the egg white and see them clearly. That’s how stiff and glossy everything should be. If you don’t, beat some longer. The rest is simple, all you do is dry it in the oven. The nests should come off easy from the parchment paper. Without a problem. If they are still sticky, just leave them in the oven for another half hour. I once even baked my meringue more the next day and nothing happened. If you keep the baked meringue in an airtight container, you can make this days in advance. No stress on Easter. However, meringue is an impressive, yet light dessert any time of the year. In this instance I filled the nest with strawberries and topped it off with some cream cheese. Any dairy product (whipped cream, yoghurt) or fruit will do. Go nuts! Clean your bowl and your mixer thoroughly. You don't want any grease on any of your utensils for this. You can also take a slice of lemon and rub your bowl with it or use some vinegar. Separate the egg white, making sure no egg yolk accidently made it to the bowl. Beat the egg whites on medium high speed until soft peaks form when you take out the mixer. This takes about three minutes. Now slowly add the sugar while you continue mixing. Change to high speed. Slowly the meringue should start looking glossy and should become stiff. Continue beating until very stiff. This should take about 7 minutes. There are several tests to know when you are done. Either you can turn the bowl upside down and the meringue does not get out, or you write something with the mixer into the meringue and it should be clearly visible. Prepare a baking sheet with parchment paper to pipe the nests on. 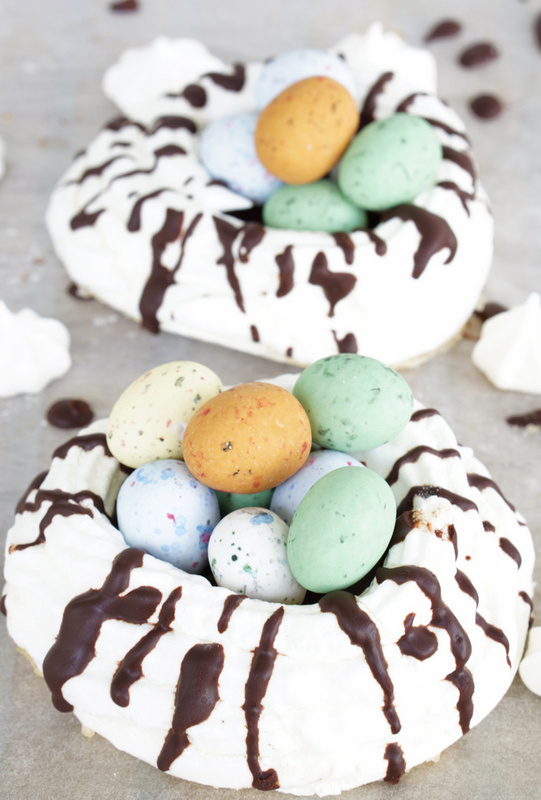 Put meringue into a piping bag (you can also use a small plastic bag and cut off one corner) and now start the nests directly on the baking sheet on the parchment paper. First pipe a circle starting from the inside, fully covering it. Then go all around the edges about three to four times. Each time you go around the edges, come a little closer to the center. You should be able to make four nests on one baking sheet. The second sheet should contain two more nests and all your stars. Bake meringue at 100 degrees Celsius for 10 minutes, then reduce temperature to 80 degrees and dry for another 90 minutes. The nests should easily come off the parchment paper. If they don't, dry them longer. I have even left them in the warm oven over night and "baked" them the next day. Once meringue nests are dry, keep them in an airtight container. They keep for weeks. Once ready to serve, melt the chocolate and butter on low heat, constantly stirring and drizzle on edges. 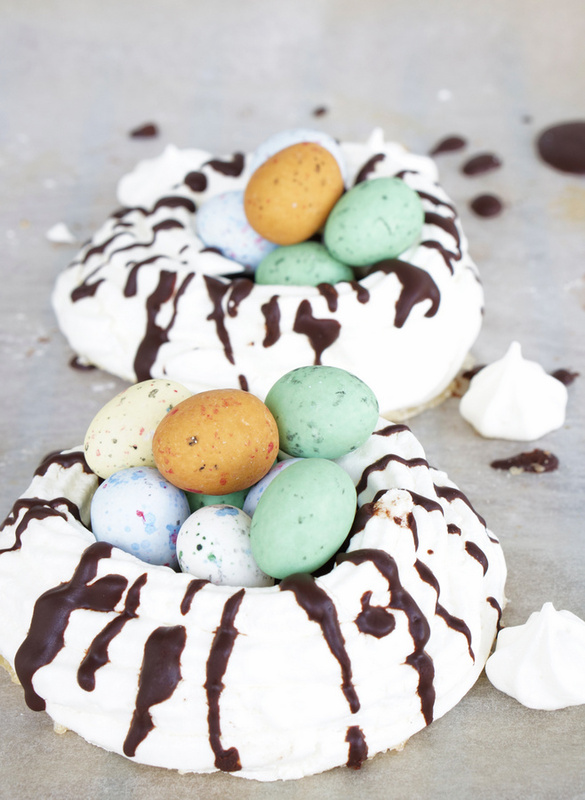 Make sure to cover the center of the nest completely with chocolate (see pictures). Either fill with Easter chocolate eggs or cut up some fruit and serve with a helping of whipped cream, cream cheese, or yoghurt.